Below are answers to commonly asked questions. If you have a question that is not listed here, please feel free to contact us at info@kellystachura.com, and we will respond to your email within 24 hours. Kelly Stachura Photography was founded on the simple premise that great dance photography requires a comprehensive knowledge of both dance and photography. Kelly Stachura has studied a variety of movement-based art forms, including classical ballet, modern, tap, jazz, acrobatics, and yoga, for over 20 years. She also earned her Bachelor's degree from the #1 ranked Photography school in the country, The School of the Art Institute of Chicago. For over 8 years, Kelly has been able to blend her passions for dance and photography though both commercial and artistic venues. Her portfolio has been exhibited locally, nationally, and internationally and has earned her several honors, including "Curator's Choice" at the Chicago Art Open (the largest exhibit of its kind in Chicago), "Best in Show" at The Art Around Us, BAAC's "Visual Arts Award", the "Purchase Award" at William Rainey Harper College's Small Works Exhibit, and "Winner in Fiber" at the State of Illinois Collegiate Artists' Competition. More important than all of the accolades, Kelly Stachura Photography is dedicated to bringing you the highest levels of quality, commitment, and customer service. We are passionate about our work, and we extend that passion through everything we do. Please remember to bring all costume pieces (including tights, hats, headpieces, and any props), and make sure that your child’s dance shoes are clean. Spring Recital Portrait Sessions last approximately 5-10 minutes. Your child will be photographed in a variety of poses, and your final images will be ready in approximately 6-8 weeks. If you choose printed photographs, you will be able to select the image(s) for your print package immediately following your session. 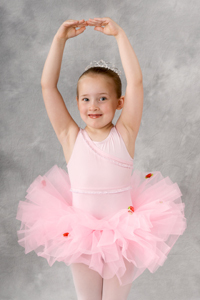 Depending on your studio, your child may be photographed in more than one recital costume per session provided they are able to change within the session window. If you need additional time, please purchase an additional session. Absolutely. We are happy to take small group pictures of siblings, cousins, friends, etc. for your Spring Recital Portrait Session. **PLEASE NOTE: If you register multiple students for a single portrait session, they will ONLY be photographed together. If you would like each student to be photographed separately as well as together, you need to register each student for a back-to-back individual session, and we can split the time between both individual and group portraits. 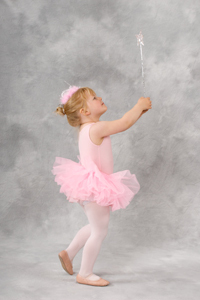 For Spring Recital Portrait Sessions, your child should be in one of his / her recital costumes. These photographs are a great way to remember your child’s dance accomplishments, and poses will be tailored to your child’s level. If desired, students may also opt to have their portraits taken with typical dance clothing (such as a leotard and tights). Children can sometimes be intimidated by their first portrait session. Many are not used to the lights or posing alone in front of a backdrop. Conversely, some children love the attention of getting to "be the star" in their own private photo shoot. With all sessions, we invite the parents or guardians into the room to watch and encourage the child. We take the time to help each and every child feel comfortable, and we make sure to tailor each pose to the child’s skill level. Especially for Spring Recital Portrait Sessions, we encourage you to think about what kinds of poses you'd like - whether it be sitting, full length, or a 3/4 length shot. If you have specific poses in mind, we are happy to work with you to capture your vision. We have years of experience both as dancers and photographers, so if you are unsure of what pose you'd like or if you need assistance, we are there to help. Registraion is available at your dance studio by completing a registration form (available in the office during open hours) and paying by cash, check (made payable to Kelly Stachura Photography), or credit card (a $3 service fee will be added to credit card transactions). Advance registration and scheduling is required. If you are unable to make your photography Session due to illness or emergency, please contact Kelly at info@kellystachura.com as soon as possible to make other arrangements. Make-up sessions will only be allowed at the Photographer's discretion and must be completed within the recital portrait's originally scheduled days at your dance studio.